Pro-democracy leader Aung San Suu Kyi is greeted by supporters during a visit to an immigration center in the migrant workers community outside of Bangkok on May 31, in Mahachai, Thailand. A new peace negotiating team, led by Burmese Railways Minister Aung Min, arrived at Mai Ja Yang, the second largest town under Kachin Independence Army (KIA) in Kachin state, at 3 pm today, according to Kachin Independence Organization (KIO) officials. The meeting, the first between the KIO and government peace negotiating team in two-months, is intended to be a discussion rather than political negotiations, said a high ranking KIO officer in Mai Ja Yang.The previous meeting with government peace negotiating team led by U Aung Thaung, in Ruili (or Shweli), in China’s southwest Yunnan province, failed to achieve any lasting results. The government wants to sign a ceasefire with the KIO before they will discuss political solutions to the conflict, which started on June 9, after they ended a 17-year ceasefire. There are an estimated 75,000 Internally Displaced Persons (IDPs), most living in KIO-controlled territories. Moreover, Naypyidaw’s leading peace negotiator is scheduled to hold informal talks with a senior member of the Kachin Independence Army (KIA) on Friday amid ongoing fighting between Kachin and government troops in northern Burma. Although government and KIA officials say they are hopeful they can reach an agreement, there have been reports in recent days that the conflict has spread to the well-known jade mining center of Hpakant. The escalation of the conflict comes less than a month after the formation on May 3 of a new government peace-negotiating team led by President Thein Sein. The new lineup consists of a working committee and a central committee that includes Thein Sein and Burma’s military chief, Vice Snr-Gen Min Aung Hlaing. Meanwhile, Aung San Suu Kyi has embarked on her first international trip since 1988. 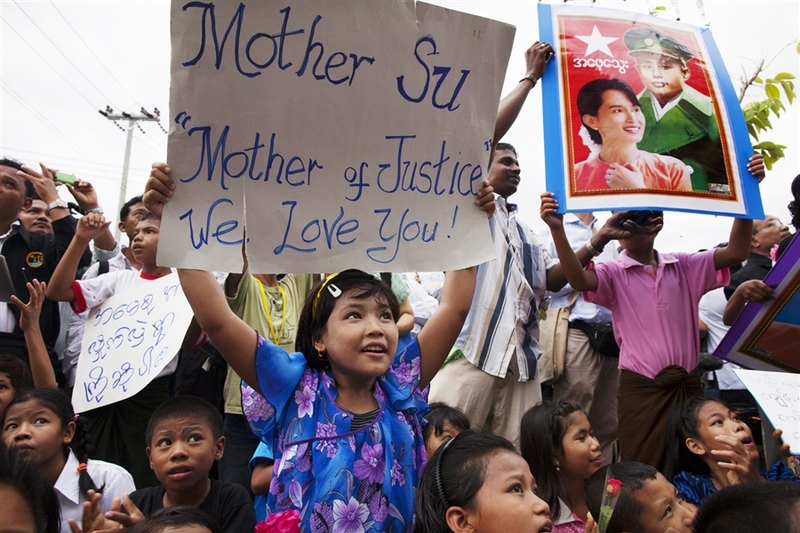 She feared that if she ever left Burma’s military government would never let her return home. She put up with 15 years of house arrest rather than risk becoming an exiled irrelevance. Suu Kyi is currently in Thailand to attend a World Economic Forum summit on Friday. Around 2.5 million impoverished Burmese have fled their country to Thailand in search of jobs. Next month she will travel to Europe, collecting while there the Nobel Peace Prize awarded to her in 1991. Despite the positive changes that have emerged under the new government led by President Thein Sein, critics say much more needs to be done before refugees can return to Burma and peace and security become a reality for Burma’s citizens. Case in point, thousands of Kachin refugees are facing food shortages as fighting between Burmese troops and the Kachin Independence Army (KIA) has escalated, preventing UN aid agencies from transporting supplies to camps along the Sino-Burmese border. The United Nations World Food Programme (WFP) sent aid in March and April, but has been unable to do so this month because the government army has stepped up its offensive near Laiza, the headquarters of the KIA, according to the Kachin relief group. With no end to the conflict in sight, there are also growing concerns about how the refugees will cope in the coming rainy season. So it is not surprising that a dozen ethnic armed groups, including those who have signed preliminary ceasefire agreements, like the Karen National Union (KNU) and the Kachin Independence Organization (KIO) that urge the US and Europe to keep their sanctions on Burma. These ethnic leaders realize that Burma’s military shouldn’t be rewarded for ongoing aggression and human rights abuses. The UNFC have now set a deadline of June 10, 2012: If the Burma military doesn’t’ stop its aggression by then, the other existing ceasefire agreements will possibly be suspended. This could lead to a complete breakdown of ceasefire talks and a widespread escalation of violence in Burma. “The US government should not reward the Burmese government’s nascent and untested changes by allowing an unregulated business bonanza,” John Sifton, Asia advocacy director at Human Rights Watch, said in a statement. The issue over Burma’s sanctions has been a hot topic of debate since Aung San Suu Kyi’s arrival in parliament. Many human rights groups are urging the West to move slowly as it re-engages with Burma, saying the country’s partial return to democracy is not cause for celebration. Burma’s elected rulers today are the same men who just two years ago led a military government condemned as tyrannical by much of the world for jailing more than 2,000 political prisoners, conducting brutal counterinsurgency wars against ethnic minorities and failing to hand over power to a democratically elected government. On Monday, the biggest rollback yet will take place, when the European Union is expected to temporarily lift most sanctions against Burma. The United States is under pressure to follow suit. Norway last Sunday decided to remove all limits on foreign aid, financing and visas. However, uneasiness over a continuing offensive by Burma’s military against ethnic Kachin rebels in the north is a major concern of those urging a lifting of sanctions. This past week, the U.S.-based activist organization United to End Genocide released a report as part of a corporate responsibility project warning that rushing to invest with Burma might only make the country’s problems worse. I think it’s important to create incentives for further reform and democratic progress. To follow up on last week’s parliamentary stalemate, Suu Kyi and National League for Democracy party chose to compromise for now, jointly reciting the oath in the capital, Nay Pyi Taw, as the ruling party and the army looked on. The NLD had refused to take its seats in the assembly last week because they opposed wording in the oath that obliges legislators to “safeguard” the constitution. The party, which has vowed to amend the document because it enshrines military power, wanted the phrasing changed to “respect.” But it is a new era for Burma as Aung San Suu Kyi took a historic oath yesterday to join the parliamentary system. Although President Thein Sein’s government has been widely praised for instituting sweeping reforms over the last several months, including releasing hundreds of political prisoners, signing cease-fires with rebels, easing press censorship and holding the April 1 by-election that allowed Suu Kyi’s party to enter parliament, there is much more to be done. More than half a million refugees remain abroad, hundreds of political prisoners are still behind bars and fierce fighting continues with ethnic Kachin insurgents in the north. Suu Kyi’s rise to public office marks a major reversal for not only the country but for a woman who became one of the world’s most prominent prisoners of conscience, held under house arrest for much of the last two decades. So there is much to celebrate about as she and her party debut in parliament this week. A “technical problem” regarding the parliamentary oath has created a political stalemate in Burma. Aung San Suu Kyi and members of her political party are refusing to take their seats in parliament over the oath’s wording, from “safeguard” to “respect,” a move that risks unraveling the fragile and unprecedented detente between the opposition and the military-backed government. However, the dispute over the oath could spiral into a major setback before the National League for Democracy (NLD) party even enter parliament. I don’t know if it’s worth it to debate over constitutional semantics when Burmese are concerned with lack of jobs, healthcare and educational opportunities. With the recent political landscape, the Burmese version of the festival is also changing. Over the past few years Thingyan has grown wilder. 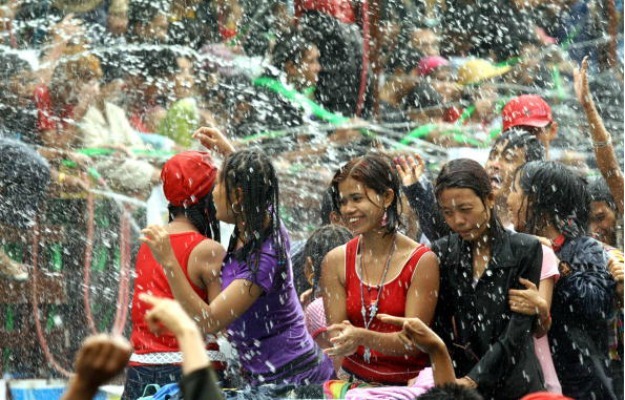 Observers have noted that the water festival, increasingly marked by binge drinking, revealing clothing, and street fights, has been the only outlet for the people to vent their frustrations after decades of military rule. The most notable sign is that the government has removed a 23-year-long ban on Thangyat chanting, rhymed couplets that are sung to the beat of a traditional drum on festive occasions. Thangyat chants are the heart and soul of the New Year Festival. The performance criticizes and makes fun of the foibles of society, a sort of verbal version of cleansing by water. “It’s been over 30 years – Thingyan and Thangyat are the two things that cannot be separated because Thingyan is for the people and it should be free for all and should not be monopolised by any individual or a group. This also applies to Thangyat to an extent,” says Sue Hngat. Also, Aung San Suu Kyi is expected to make her first trip overseas in 24 years. Officials with her National League for Democracy party say the Nobel Peace Laureate will travel to Norway in June overcoming the fear she once had of not being able to return to Burma.